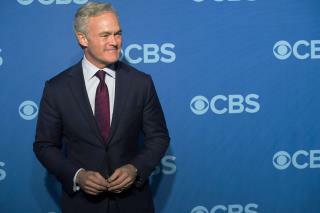 (Newser) – Scott Pelley is out as the anchor of CBS Evening News, and Megyn Kelly's anticipated new Sunday night show on NBC might have something to do with it. Kelly's show debuts this weekend, and a wary CBS is looking to beef up 60 Minutes, which runs at the same time, reports the New York Times. Pelley is seen as a big part of that strategy, and he is moving full time to 60 Minutes. The New York Post's Page Six first reported that Pelley is out as the evening news anchor, a seat he has held since replacing Katie Couric in 2011. The Post, however, suggests that friction between Pelley and CBS News president David Rhodes is the main issue. How will Sunday Night Football fit into all of this? Football always wins out! Mr. Chin lands on his chin! Looks like they're still trying to pander to the coveted female demographic.